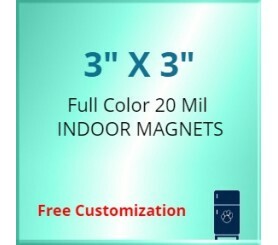 3x3 custom magnets 20 mil square corners can be considered for imprinting special or regular business information. This magnet offers impartial imprint space for positioning business information. Marketers who wish to say a lot about their brand can always avail it for gifting during promotional events such as tradeshows, business conferences, shopping festivals, etc. It can be used for festive sales driving or for thanking customers on special occasions. 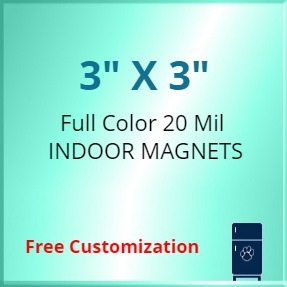 We offer attractive price savings on bulk orders of this magnet. Request a quote to know savings that you can avail on bulk orders of this customized 3 x 3 inch square corner printed 20 MIL full color magnet. Product size – 3x3 inch. Product Size: 3 in. x 3 in.